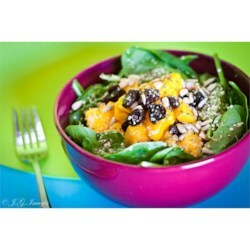 "An out of this world salad that will have your dinner guests begging for the recipe. It is also versatile - summer berries are a nice alternative. I wouldn't normally tout a brand, but the only company I know that makes maple flavored balsamic vinegar is Wildly Delicious in their distinct tall blue bottles." This salad was very good, great combination of flavors. I didn't have maple flavored balsamic vinegar, so I used regular balsamic vinegar and added some real maple syrup. definately a keeper. took to pot luck luncheon and was immediately asked for the recipe. works well with mandarin oranges too. I couldn't find maple flavored balsamic vinegar, so I just used regular balsamic vinegar. This salad was incredible! I definitely plan on making it again in the future. Delicious salad! My husband couldn't get enough. I didn't have almonds, so I toasted some walnuts ... excellent! And I used plain balsamic vin. Thank you! heavenly when the mangos are just ripe. I also added sweet red pepper strips to this salad.